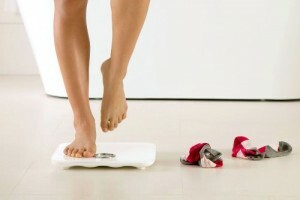 Weight is only one indicator of an effective diet and exercise plan. When you say you’re trying to lose weight it’s pretty safe to assume you actually mean “lose fat” yet most people solely focus on the weight number. While tracking your weight can be a good indicator of progress, tracking your body weight is also a huge help. It can help you see when you actually start getting rid of fat rather than losing water weight. It can really help you track your progress towards a healthier life. Most people only get their body fat measured during a physical, but now you can get your body fat percentage every time you weigh yourself with the Fitbit Aria Wi-Fi Smart Scale. Yes, it’s made by the same people who make the activity tracker – and that actually makes things even easier! You can set it up to automatically sync up with your Fitbit website profile. You’ll get all kinds of neat graphs and charts to show you how you’re doing. You can view them side-by-side with graphics showing your activity (if you also have a Fitbit tracker) to see how they correlate which can be awesome for motivation. Oh, and it’s not just a one person tool either. Your entire family can set up profiles and the scale will be able to tell which of you steps on it every time you weigh yourself so the right profile is updated. It can automatically recognize up to eight individual users. Inspiration on a wrist!! Brings out competitive nature and assist with health. Super Fitness Watch! Train smarter and go farther with Surge. If privacy is your issue, don’t worry. You have full power to customize who can see your results on the Fitbit website. You can quickly and easily set everything to private so no one can see it and it’s password protected so even other members of your family can’t snoop if you don’t want them to see your statistics. There are some important things to know before you buy though. First, the weight limit is 350 pounds. It won’t be able to display a weight for anyone who weighs more than that. It should also not be used by pregnant women or people with pacemakers. The pulse it uses to measure body is safe to the average person but it’s recommended to avoid it in those cases. tile, and flooring like that are all good though. The last important thing worth mentioning is that it syncs via Wi-Fi and a wireless internet connection is required for setup. Overall the Fitbit Aria Wi-Fi Smart Scale is a great scale and the ability to measure body fat is something you don’t see in many scales. It puts the Fitbit Aria scale miles ahead of the average bathroom scale making it a worthwhile investment for anyone who is serious about monitoring their weight loss.